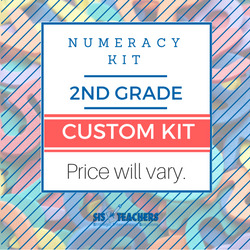 This Numeracy Kit supports the 2nd grade classroom. All recommended items are listed in the menu on the right. Click the drop down menu for each item to select the desired quantity of that item. The price of the kit will vary depending on the quantity of items selected. The total will calculate as items are selected. Kits are assembled and labeled, ready for classroom use. Items in kit are also sold separately. Not sure where to start? Try our Full Kit or Mini Kit. Full Kit is recommended for 30 students. Mini Kit is recommended for 6-7 students in a small group.